You may recall in this post that I recently visited the Goodwill on Broughton in Savannah, GA. Well, while I was there, I stumbled upon a sweet little desktop clock that was perfect for a specific project. AND you may recall from this post that I’ve got a yen for creating more wildlife habitat options in our backyard. Well, my friends, the time has come to finally transform the clock into its new purpose in life- a birdhouse! This clock… seated under the word “Creating”… completely drew me in! First things first: I had to de-construct what I could, which included removing the clock apparatus and the back panel…easy stuff. I painted the new hole, glued it to the inside of the house, effectively creating a smaller front door, and then brushed the entire exterior with water sealant. It IS going outside, afterall. Once the sealant had completely dried, I needed to “build up” the nest area. Birds like to enter a birdhouse and effectively hop right into their nest. So I used some old wine corks (ya’ll know I have tons of those) to fill up the bottom of the clock. I then re-attached the back panel and brushed it with water sealant. I also added a large screw-in eye to the very top (secured with a nut inside) for hanging purposes. I was then ready to hang it up! It’s on one of our back maples and faces right into our bedroom window- so I hope to see birds using it soon. 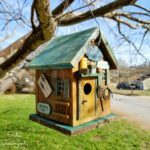 Crafters make birdhouses out of all sorts of things: old leather boots, ceramic teapots, aluminum canisters, you name it. I’m totally going to make more bird houses- the more “places to raise young” options, the better, right? Let’s hope the birds think so, too! I love this idea. If I ever find an old clock I am going to make one. Pinned. That is so neat! I’m going to have to start watching thrift stores and yard sales for something similar. 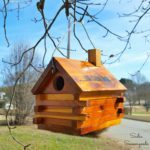 Gorgeous bird house! So clever to use an old clock!! I love birdhouses and this is an amazing idea! Love it!!!! This is so creative! I love repurposing and this is fantastic! Thank you so much for linking at On Display Thursday – we are so happy to have your talent shared! Such a cute idea to gut an old clock. I can totally see my youngest loving this project. She loves to watch birds in our backyard. Thanks for sharing on Merry Monday. That is a fantastic idea! I’d much rather share it with the sweet birds than have another clock in the house. How cute is this? I love it! The wild birds in my yard would love it. I’m going to keep my eye out for a cool old clock. Pinned again & shared. Thanks for sharing your diy at the party! I love your birdhouse! It is adorable but I am a little concerned about that hole. I just feel like it should be even smaller as I’ve not seen one quite so big. You mentioned that you hung it in one of your back maples. Do you have oak trees? They are huge for squirrels and I think they could possibly get in this birdhouse. What are your thoughts? The hole might be deceiving me but I don’t know for sure?? Your creativeness never ends! Is Cottonball a housecat? I bet (s? )he loves watching the birds through the windows! Did your birdhouse get lived in this year? He is a housecat- we have a screened in porch which is as close to being outside as it gets for him! And we had chickadees in our front (always nested) birdhouse this year!! !